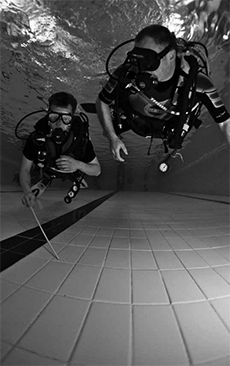 A blind man has conquered his disability to plunge into the underwater world. Robert Ainsley-Raffel was born blind but that hasn't stopped the have-a-go Geordie making a splash with the British Sub-Aqua Club (BSAC). They have helped the 25-year-old from Hexham complete his training in a swimming pool with flying colours and now Robert is looking forward to his first open water dives and passing his Ocean Diver qualification.